Christians often view the Grand Canyon as an icon of Creation and The Flood, but did you know Wisconsin also has an area that is full of compelling evidences of the same? Posted her are a few pictures, and as I have time I will comment on them. 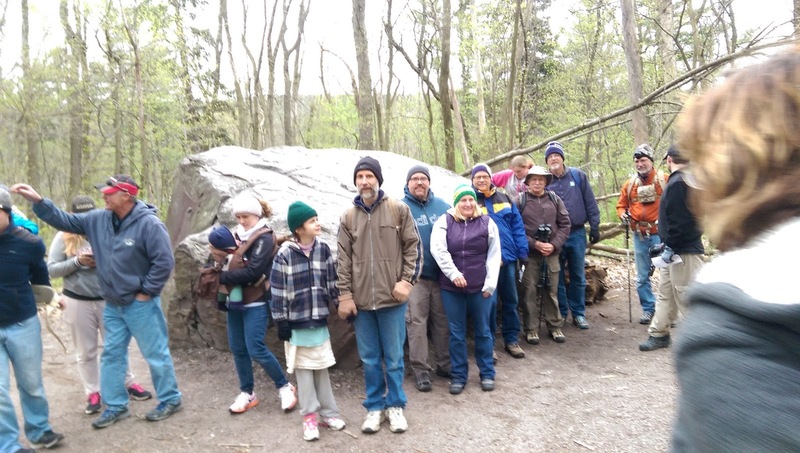 An adventurous group hiked near Baraboo on Saturday and learned some fascinating geology correlating with Biblical history. The Sauk megasequence is named after Sauk county and is seen worldwide from the Grand Canyon, to Wisconsin, to the Middle East, to Africa. 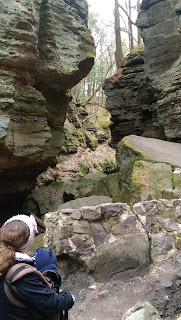 The Parfrey’s Glen formation is made up of sandstone which is the same as the Tapeats sandstone in the Grand Canyon. Parfrey’s Glen is located near County Highway DL in Merrimac, WI. On June 7, 2008 Sauk county received 6 inches of rain in 8 hours. 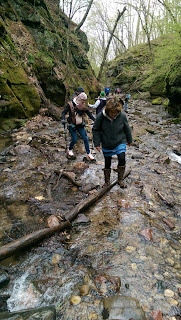 This flash flood caused the entire boardwalk and paved path system of Parfrey’s Glen to be destroyed, and washed out a new gully at the location of the old parking lot while blocking the original channel with large chunks of rock and concrete from further up the glen. The hill behind the glen is made of the same Baraboo quartzite at Devil's lake but is only visible at a small outcropping. You can see the 25 degree angle consistent with the Baraboo bowl shaped syncline. Remaining in the glen are several igneous rhyolite and granite erratics. These rocks are not native to this area but were transported by the glacier all the way from northern Wisconsin or Canada. 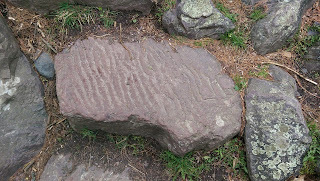 Since the Baraboo quartzite is from the creation week, then the Parfrey’s Glen conglomerate sandstone would have been the first layer deposited in the worldwide Food. 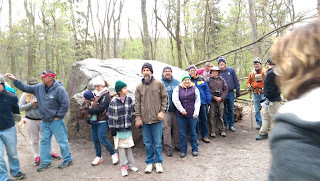 This sandstone covers the bedrock and is a conglomerate consisting of rocks and boulders of Baraboo quartzite. During the flood other layers (Mt. 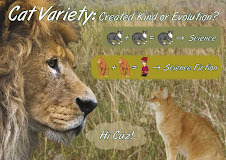 Simon formation, Eau Claire formation, etc.) intersected the Parfrey’s Glen formation which lies on the sloping syncline of the Baraboo formation. Since Parfrey’s Glen conglomerate is found uniformly from the bottom of the bluff to the top, the same environmental conditions (the Flood) must have been in place while the entire bluff was being buried. Just a few hundred feet to the south and southeast, the Parfrey’s Glen formation intertongues with the rest of the Sauk megasequence layers which are horizontal. According to evolutionsists, these horizontal layers were formed over a period of 128 million years each under different environmental conditions including deep and shallow seas, beaches, and dry land. Obviously environments this different cannot exist within a few hundred feet of each other over millions of years. The most straightforward explanation is that all of the rock was deposited over a short period of time under flood conditions. Since Wisconsin sits on top of the granite continent, and the granite floats above the basalt ocean basin, then Wisconsin could never have been under an ancient ocean. 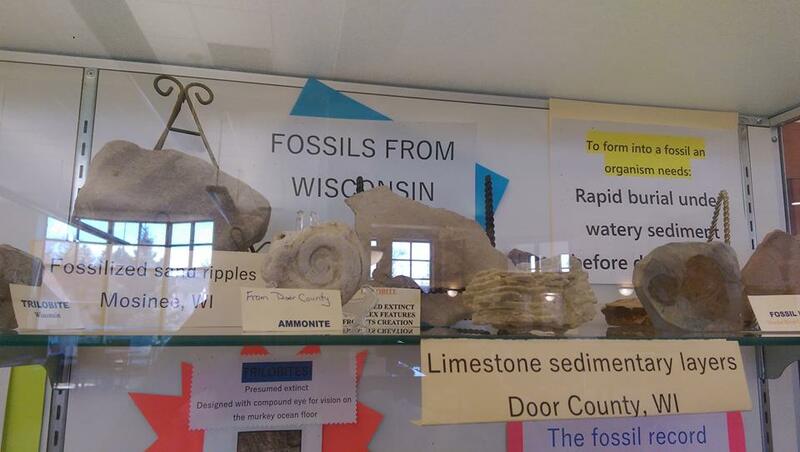 All the sand (and cementing material to make sandstone) in Wisconsin had to be transported here from the coastlines. Being located at almost a center-point between the Pacific, Arctic, and Atlantic oceans the Flood water currents would have been coming from all directions carrying sand and silica from various sources. The flood waters deposited all the sedimentary layers we see today, but they also deposited over 325 ft. of additional sedimentary layers which eroded at the end of the Flood. The release of this overburden caused orthogonal fractures (cracks at right angles) in the underlying rocks. Looking from above you can see that all the dells, glens, and the Wisconsin River follow right angle patterns that started as fractures which runoff water eroded into larger waterways. The erosion of the glen probably started with the Flood, but runoff and ruptures of glacial lakes widened the glen to what we see today. Rapid water flow also carved potholes in the glen riverbed. As the riverbed eroded some of these potholes remained up on the walls of the glen. As the glaciers melted the under cutting of the sandstone caused large boulders to fall at the end of the glen. The flash flood of 2008 destroyed what used to be the scenic overlook at the end by the same undercutting process. 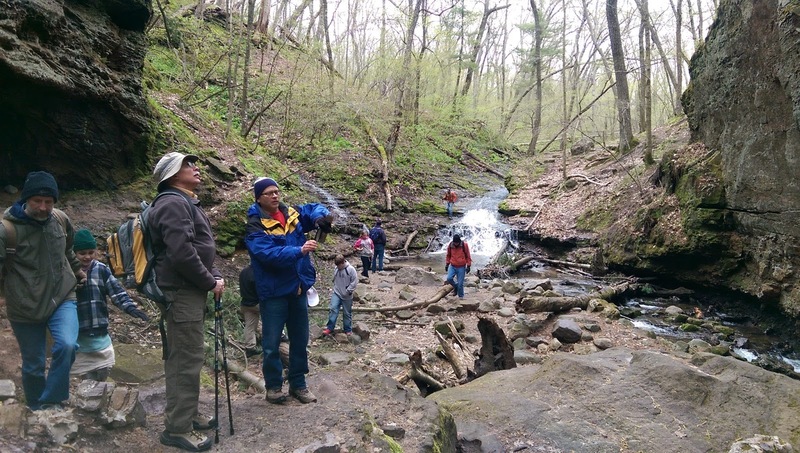 Parfrey’s Glen is the type site for the Parfrey’s Glen Formation, a formation that has outcroppings all around the Baraboo Bluffs. As we hiked the trail, looking straight ahead at the base of the hill the first time we forded the creek, we saw quartzite bedrock at about a 25 degree angle from horizontal confirming the fact that the quartzite has been folded. Once we climbed the first set of rock stairs and entered the narrow portion of the Glen, the quartzite bedrock cliff is buried several hundred feet west of the sandstone conglomerate that you have pictured. The only quartzite that you see in the narrow gorge are the pebbles and boulders of quartzite that had been broken off of the bluff by flood waters and cemented in a sand matrix. 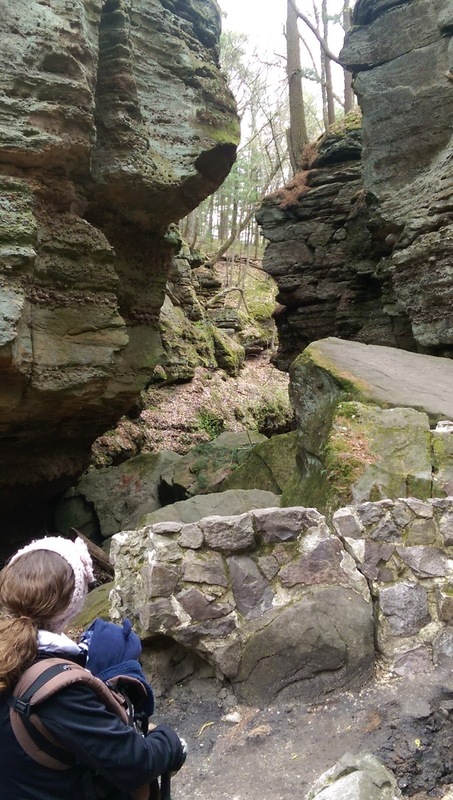 Unlike any other rock layer in the area, the Parfrey’s Glen Formation is a near vertical layer and was placed that way in situ up the face of the quartzite cliff. 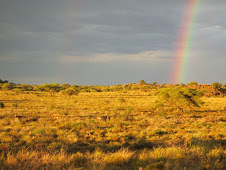 No matter what the geological “period” being studied, this formation remains the same and is therefore good evidence for deposition by an ongoing catastrophe of much shorter duration than evolutionists assume. If that were not the case, we would expect to see the conglomerate matrix to shift from sand to silt and then lime as the layers next to them did. But that is not what we find. The layers of sand, pebbles, rocks, and boulders were sorted by wave action and currents which changed constantly throughout the flood. While the Glen was glaciated, it was near the farthest reach of the glacier (terminal moraine). Therefore, this area endured the glacial abrasion for a shorter time frame and was not scoured clean. The glacier’s progress was also being impeded by its climb up the very hard quartzite bluff. 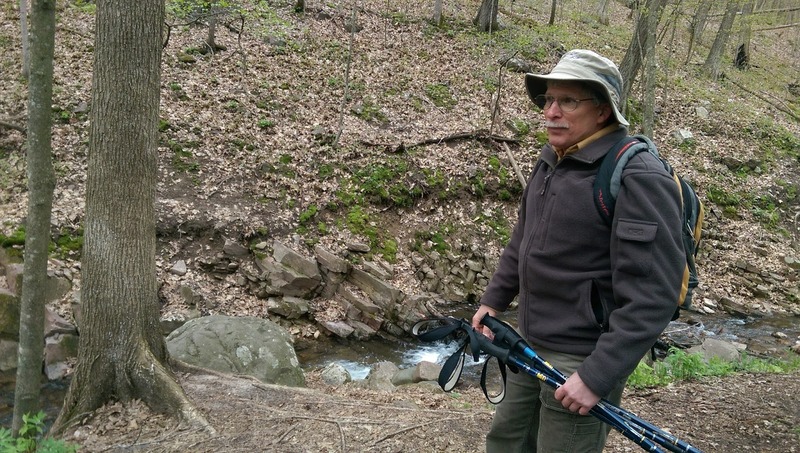 It is difficult to say exactly how the Glen was formed but was likely a combination of receding flood waters cutting a channel through the Parfrey’s Glen Formation next to the resistant quartzite bluff and a deepening of that gorge by glacial meltwater later on. There was no dam breach erosion here as occurred in the Dells area. Ripples form in sand from waves or water flowing. The top layer of sand could have developed ripples while underwater, and the catastrophic movement upward on day 3 instantly metamorphosed those ripples into quartz. Quartz in its pure form is just silicon dioxide (SiO2). Liquid silicon dioxide is clear (like glass). 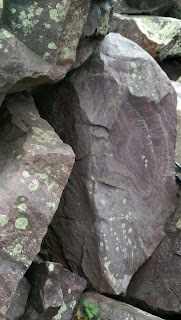 The red color in the Baraboo quartzite is from varying amounts of iron mixed in the silicon dioxide. The layering of sand is evident in cross sections, and shows signs of moving water before God moved it to emerge above the surface. Each crossbed layer (horizontal layer with diagonal lines through it) was formed when fast-flowing water built sand waves that were originally twice as high as the resulting rock layer. The twisted structure seen in some quartzite forms in sandstone when an earthquake shakes the sand underwater on a slope. The Baraboo quartzite forms a bowl around the city of Baraboo. This bowl shape formed as the center depressed and the edges arose. This bending of the rock left slickensides on the horizontal planes between layers. These slickensides must have formed while the rock was warm enough not to fracture, but cool enough to leave evidence. Quartzite is a common metamorphic rock on the Earth, but it only appears at the surface in a few places because it is usually very deep. 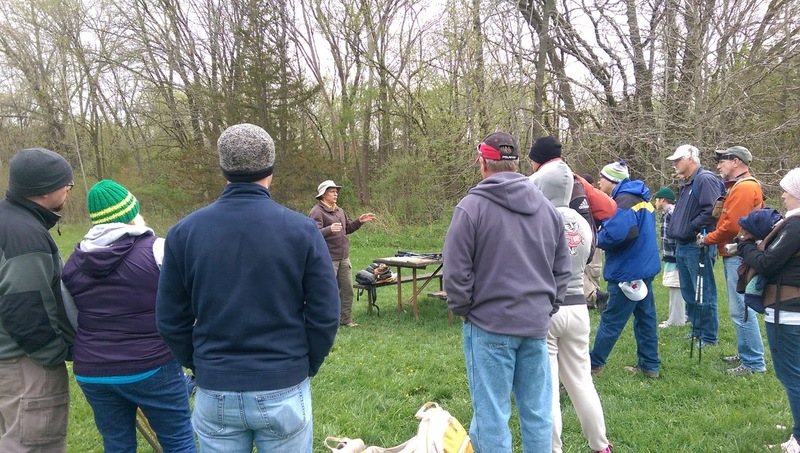 The Baraboo quartzite is one of the few places in the world where scientists can study a quartzite formation. It is impossible to measure the age of a rock. Several techniques have been developed to measure the elements in rock and use assumptions to determine the rock ages. The granite intrusions in the Baraboo quartzite were uranium-lead dated to be between 1.64 to 1.76 billion years old; however, helium diffusion rates of the same rock yields rock ages of 6,000 years old. 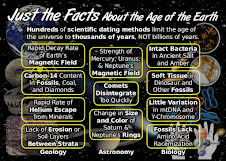 Since raidometric dating methods are built on assumptions there is no way to know if a date is correct because it is impossible to go back in time to verify if the assumptions are true. The only way we can know what is true is if we follow the words of someone who was there and cannot lie. While the Bible is not a science book it never contradicts science, and science always confirms the Bible is true. 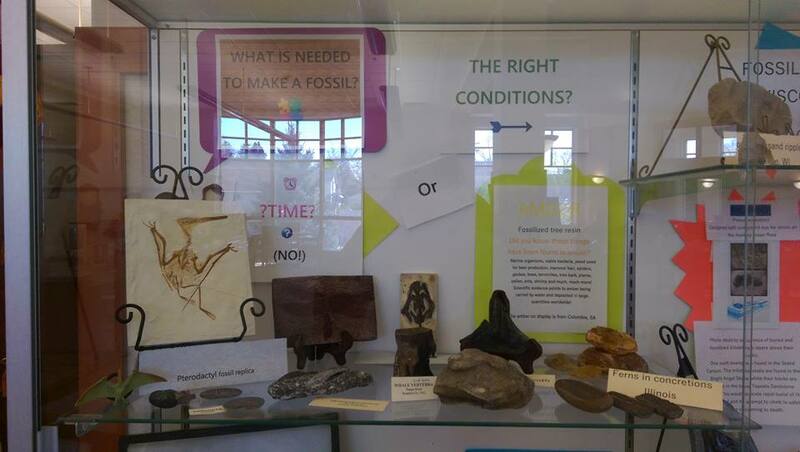 2.Is on top of layers containing fossils. At Devil's Lake you find potholes that were carved from swirling water. The potholes occur on the inside corner of a river bend when a course rock (chert) settled in a depression and were spun by the water moving past. The mystery for long age geology is how a river was flowing 500 ft. above the ground level! These potholes must have formed from the worldwide Flood waters as they were leaving the continent because at no other point in history was the water level that high. Wisconsin is dome shaped with the peak of the dome in northern Wisconsin. At the end of the Flood sheet erosion removed almost all of the sedimentary rock in northern Wisconsin while leaving sedimentary layers in the south and at the east coast. At the height of the Flood there was as much as 325 ft. of sedimentary rock above the top of the Devil's Lake bluffs. These sedimentary layers can still be seen in other places in Wisconsin like Blue Mound. 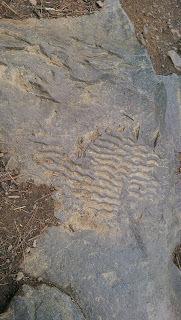 Though full of debris from the winter, you can still see the pothole formations in the very hard quartzite. 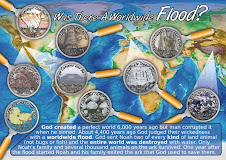 The runoff from the Biblical Flood gives a very solid explanation for their formation. Secular geologist call them "mysterious", but Christians have the Biblical text that gives understanding to the past. A megasequence is a sequence of rocks of the same contents that all appear in the same order across the globe. The rock layers in the first megasequence (Sauk megasequence) appear in the order of sandstone, shale, and limestone. The base layer of the Sauk is the coarsest layer being a conglomerate of sandstone and chunks of other rocks. After the conglomerate the smaller sized particles of sand drop out of the flowing water forming sandstone. Then shale drops out from silty mud. And finally the lime settles or precipitates into limestone. This megasequence as well as others have been to date found content wide in America, Africa, and and South America. Most megasequences span multiple contents. The only way a worldwide megasequence can be explained is by a worldwide flood. - Before the fold up of the Rocky and Appalachian mountains, northern Wisconsin was a high point on the continent. The sheet erosion event at the middle to late Flood exposed the igneous and metamorphic rocks that were created during the creation week. - The Flood sedimentary layers that were not removed contain many amazing fossils like jellyfish and trilobites that can be found in quarries throughout the state. 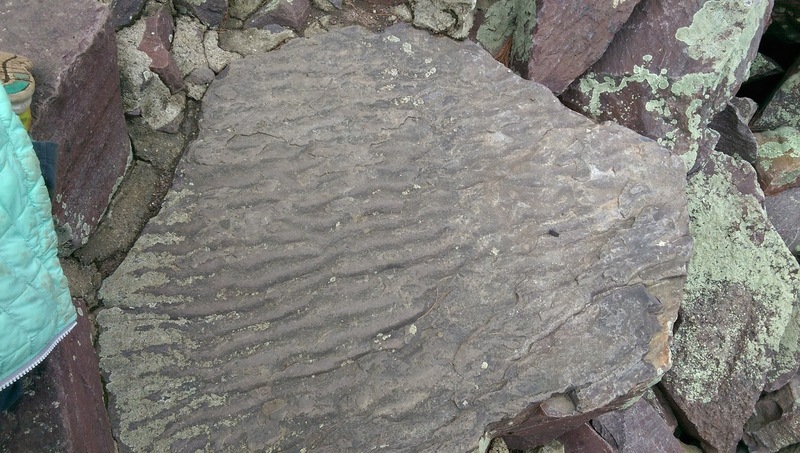 While much of the flood was violent and deposited conglomerates with huge boulders, the preserved jellyfish and sand ripples indicate the Flood ebbed and flowed between catastrophic and gentle. - The glaciers came through Wisconsin leaving much evidence in lateral moraines, terminal moraines, till, erratics, drumlins, scraped rock, and kettle lakes. The moraines we see today are probably what was dropped at the end of the Ice Age. Each year the glaciers expanded and retreated with the seasons, reaching their climax about 500 years after the Flood. - The south and west part of Wisconsin is covered with the Driftless Area. This is a part of the state that was not glaciated but was catastrophically eroded. Highway road cuts clearly show horizontal layers deposited by the Flood, but the uneven erosion indicates catastrophic water flow. 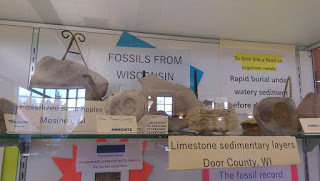 - Large amounts of water flowing through soft, easily dissolved limestone allowed for the formation of caves across Wisconsin. - Wisconsin is surrounded by two of the largest bodies of fresh water on the planet that provide beaches, islands and bluffs. Walking along the shore you can easily find fossiliferous rocks containing various corals. - The subcontinental divide runs through Wisconsin. The southern and western part of the state drain through the Mississippi River out to the Gulf of Mexico, while the northern and eastern part of the state drain out the Great Lakes through the St. Lawrence sea way to the Atlantic Ocean. The items presented here is a summary of data from multiple researchers, interpreted with the Bible as our starting point. The creationist model of geology changes as new facts emerge; however, the current model explains everything we see. What's the Evidence? 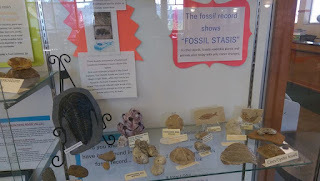 put up a beautiful fossil display at our local public library last week. 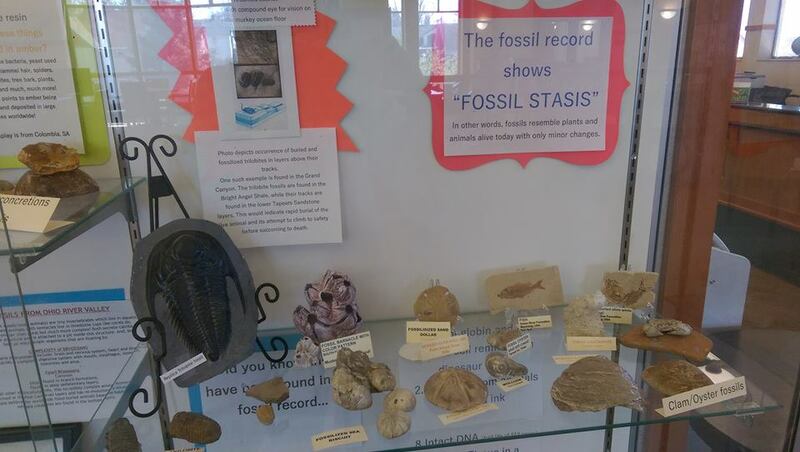 Over the years we have collected some pretty neat fossils found worldwide, and in our fair booths we display them without shame as evidence for the Biblical Flood recorded in Genesis. I tweaked our posters to make them more friendly to the library patrons. 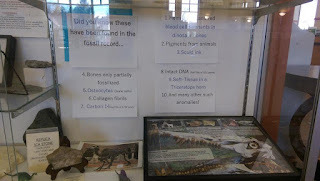 In other words , the facts of fossils were spelled out, and The Flood evidences mentioned, but the Biblical references were mild, as you can see in the pictures. "Religious or political materials which have the primary purpose to effect or proselytize for a single point of view." You can read it on our policy page. There have been a few complaints about it. She didn't really want you to have to take that out, but it is a board policy - maybe I'll just take out your little business card too and keep it on my cart in case anyone is interested? I emailed her back asking that she not remove anything until I speak with an attorney. She immediately wrote back assuring me that she would not take any of my display down until I contacted her. I then alerted an attorney from Liberty Counsel. He began to look into the issue and let me know that their policy is unenforceable given their practice and the law. 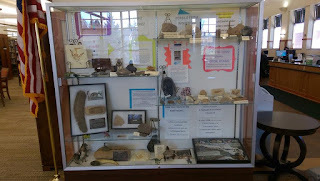 This morning the librarian called me back and told me she talked with the director and board president and they determined I did not need to remove or cover any part of my display! Just the idea I was communicating with an attorney made them think twice about squashing my free speech. I'm in the process of an open records request to find out more about the nature of the "complaints". I'll keep you posted. The library is now going to revisit their display case policy. I believe it is important to advoate for this, among other things, language to be included in the policy: "In carrying out this policy, library staff shall not engage in viewpoint discrimination on the basis of religious or secular viewpoint." Feel free to contact library personel about this. Through an open records request I found that one patron complained about the display being religious proselytizing. 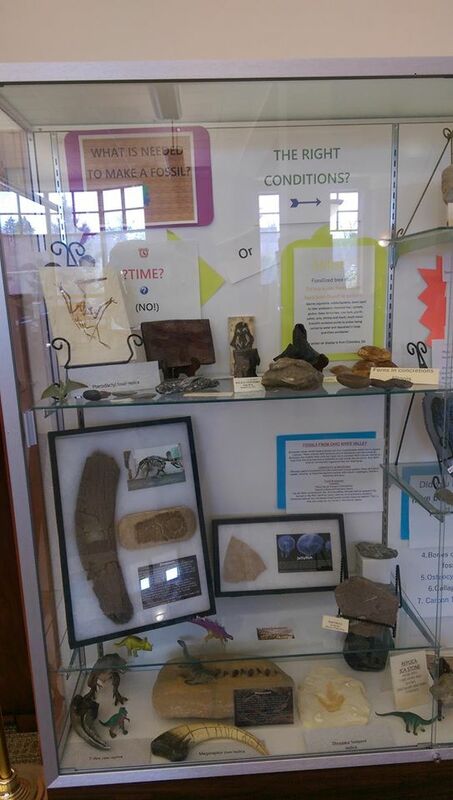 The teen service librarian then took photos of the display and emailed Amy Becker, the director, who then requested I alter my display and take down the Bible verses and the card that identified What's the Evidence? as the sponsor of the booth.